Word ميثاق (verse 63) comes from word وثق. It’s a covenant or promise that comes with a huge responsibility. Do we understand the gravity of signing such agreement? Alhamdulillah most of us are intentionally happy being Muslims. At least, we have it in our hearts that this deen is the right one. But do we understand that knowledge alone isn’t enough? 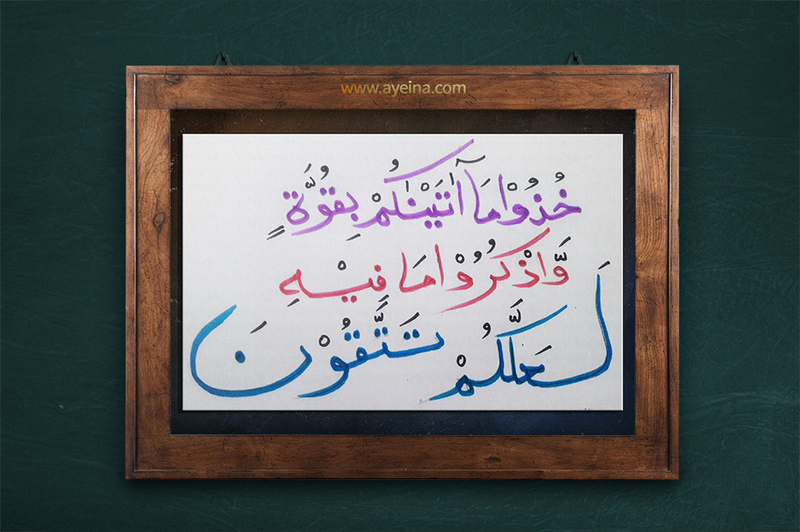 Just uttering the words لا اله الا الله like cramming isn’t the only requirement to reside in Jannah. We, by entering Islam, say and believe in Allaah being the only Rabb and are held responsible for following His commandments as sent by Him through His chosen Messenger(ﷺ). We do understand the seriousness of the matter for we have a final abode to struggle towards because this life is soon-ending. Allaah loves us, wants us to be on His chosen path and attain taqwa to reach our awaited home filled with serenity, pleasures and tranquility. So when we don’t get things straight, we are taught a hard way…. Can you recall this very earthquake that shook us on the night of 26th December? Are we waiting for more? Solution 1: تتقون till خذوا (Take and hold it till you attain taqwa (piety)). Scan your questions! Questions are a great way to learn, but we should keep a check on ourselves to understand the root cause of our own questions…. Are they for learning? Or To understand better? To find a fox-way-out of the prescribed way? Or to belittle the one in conversation with? Bani Israel’s questions were to belittle and question Musa a.s. as a messenger. They weren’t willing to act upon the commandments of Allaah s.w.t. so they questioned and questioned to satisfy their goals. To find a way out of obedience. But can anyone really plot against Allaah? All one can dig is a greater hardship for oneself. The Messenger of Allah (ﷺ) delivered a Khutbah and said, “O people! Hajj (pilgrimage to the House of Allah) has been made incumbent upon you, so perform Hajj.” A man inquired: “O Messenger of Allah, is it prescribed every year?” He (ﷺ) remained silent till the man repeated it thrice. Then he (ﷺ) said, “Had I replied in the affirmative, it would have surely become obligatory, and you would not have been able to fulfill it.” Afterwards, he said, “Do not ask me so long as I do not impose anything upon you, because those who were before you were destroyed on account of their frequent questioning and their disagreement with their Prophets. So when I order you to do something, do it as far as you can; and when I forbid you from doing anything, eschew it.” [Muslim]. Isn’t knowing that Allaah said it, enough? Do we doubt His wisdom or do we doubt His mercy? Or do we want a way out of obedience while dreaming about Jannah after this life? So once He said فافعلوا ما تؤمرون… we are supposed to act without questioning. Our little minds sometimes can’t grasp the grandeur of Allaah’s wisdom. May Allaah make us obedient and may we love being His obedient servants. When bani Israel asked if Musa (a.s.) was trying to ridicule them, Musa (a.s.) replies that he doesn’t wish to be among the ignorant ones. In our culture sarcasm and mocking someone (mazaak urrana) is a way to judge someone’s intelligence. If you can’t come up with an insult right away then you’re not competent enough. You can take an example of rap battles. Or just general school/high school/college life. Cool kids are those who know how to shut others with their so-called confidence. They’re famous because they can make anyone feel inferior. And that’s a definition of being smart and clever. Although there’s nothing but arrogance and ignorance in it. Know the difference between Humor and mockery. They are two completely opposite things.